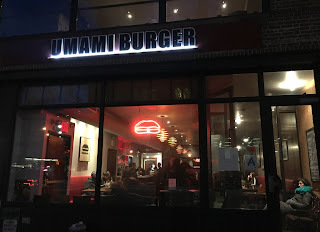 In mid February, 2017, my husband made a reservation via Open Table at Umami Burger in Greenwich Village, but when we got there, we saw a dark restaurant with a paper stuck on the door says they're closed due to the pipe repairs, but the date they said they'd be closed till was already passed so that we went there just to find it closed. It's a huge disappointment and last week, my husband called the restaurant before making a reservation via online to make sure they really are open now, and as they were, we reserved a table via internet since they take reservation through the phone for only parties more than 6. They really don't care about the customers and brought us to a table here. Who the heck want to sit on the crack between sofas? Not me, especially when the restaurant was empty. Discounted menu between 4 PM ~ 7 PM from Monday to Friday. Truffle fries were still on sale when we're there so we decided to try it. 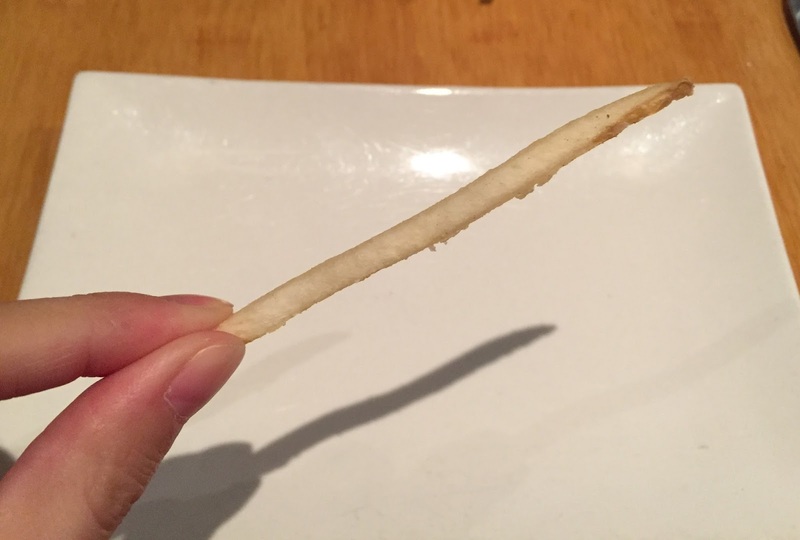 Fries were skinny and very crispy, and they're covered with truffle salt, truffle cheese fondue and chives. They had fragrant truffle flavor and really tasty but also quite salty. 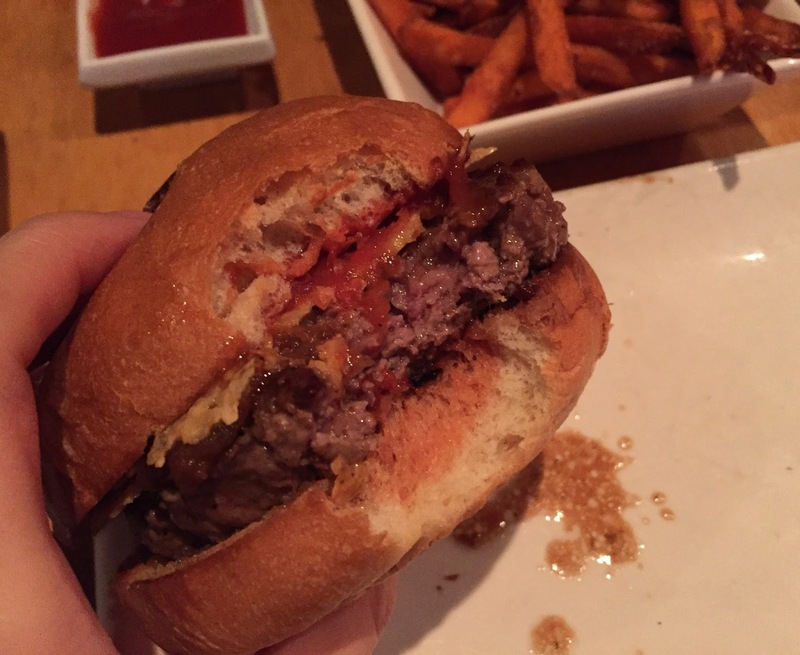 Personally, I thought the fries tasted better without ketchup because of the truffle and cheese. 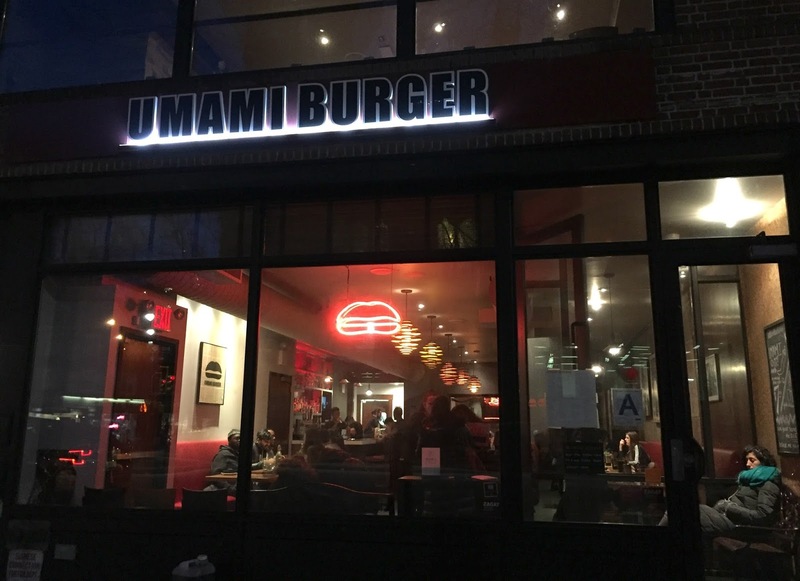 The bun had U, the capital of the name of the restaurant. 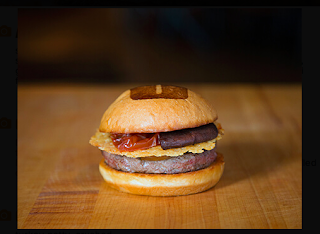 This burger consists of Parmesan frico, shiitake mushroom, roasted tomato, caramelized onions and Umami ketchup, but I was upset to see this itty-bitty piece of shiitake unlike the image on the HP. I guess it's one of these "Image is for illustration purpose" things. Parmesan frico (grilled to crisp parmesan cheese chip) was looking good and under it, there're caramelized onions and a hand-formed 6 oz. patty that is ground in house daily. The patty was cooked to medium as I asked and the center was lightly red, and it's so juicy that the juice overflowed. Roasted tomato and ketchup were very strong and the mushroom was so tiny as I mentioned above, I didn't taste anything. 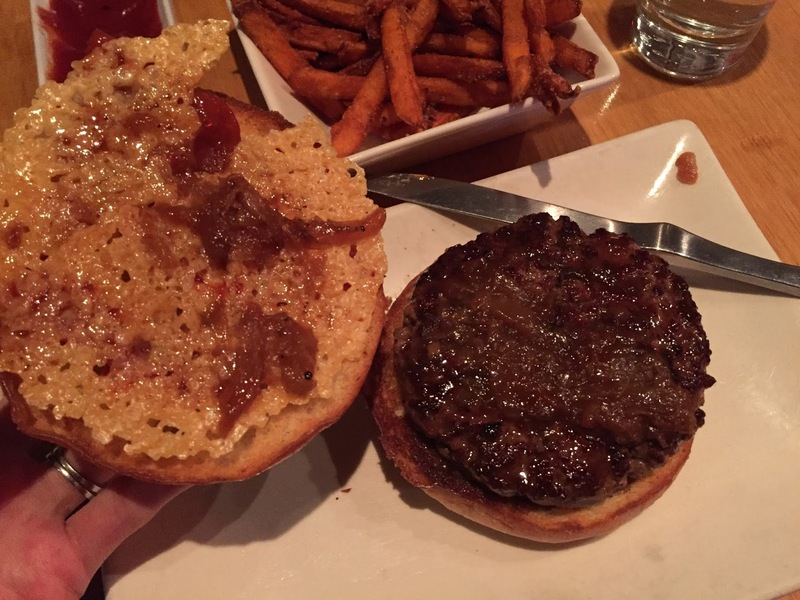 I wish they had put less ketchup to balance with other ingredients. The bun were nicely grilled and had some crispiness while the top and inside were soft. 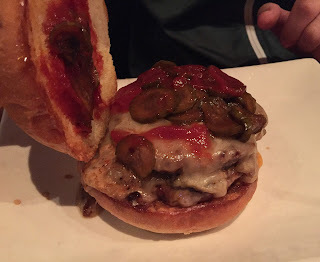 The patty itself was one of the best that I've had, I think. 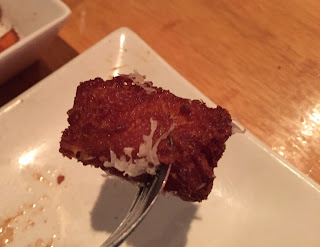 Parmesan fisco was crispy and interesting, but I prefer regular, melted, and gooey cheese. There're two 3.5 oz. 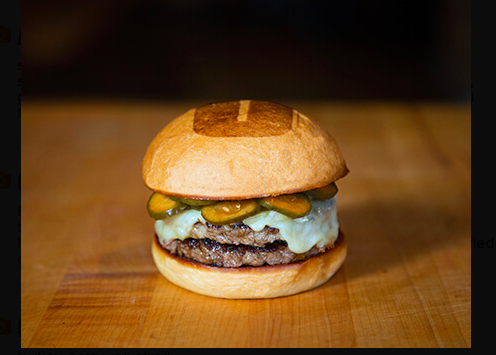 patties, white cheddar cheese, miso mustard, Umami ketchup, soy pickles and minced onions, but unlike Umami Burger, they didn't ask how we'd like the patties to be cooked, though given that the patties were thin, they can't really do much other than cooking a certain way. The image on the HP has lots of pickles sticking out. When I saw "soy pickles," I thought they're pickled soybeans but apparently it's a type of pickles soaked in soy sauce and vinegar. At the bottom bun, there's a generous amount of miso mustard and it was as intense as the ketchup. Miso mustard was fragrant and mild at first, but at the end, it had the characteristic yellow mustard tanginess and heat. However, many pickles on the top were even stronger than the 2 sauces and they're very salty and sour, and not crunchy but soggy-soft. 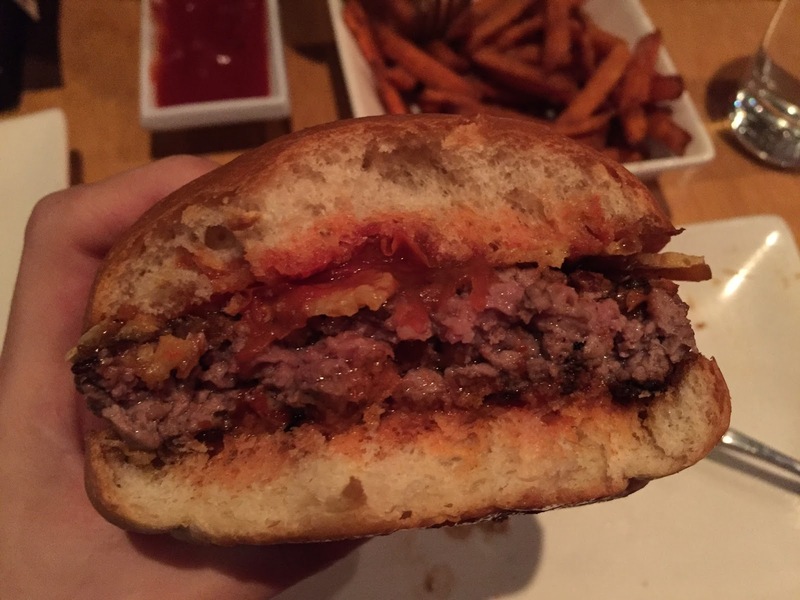 It's like a intense flavor with intense flavor burger, and the patty, cheese and onions weren't as vivid as they could have been. House made tater tots filled with sharp cheddar and parmesan. Shredded parmesan cheese and truffle salt were sprinkled over them. 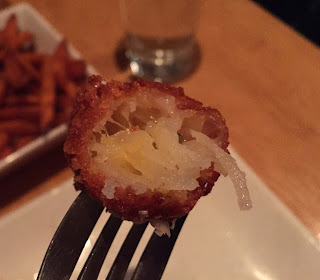 The crumbs were so crunchy-crispy that sometimes they even hurt my mouth. Shredded potatoes inside was moist and soft, and I enjoyed the light cheesy flavor. But they're unbelievably greasy as if they hadn't been drain any oil after being taken out from the fryer. 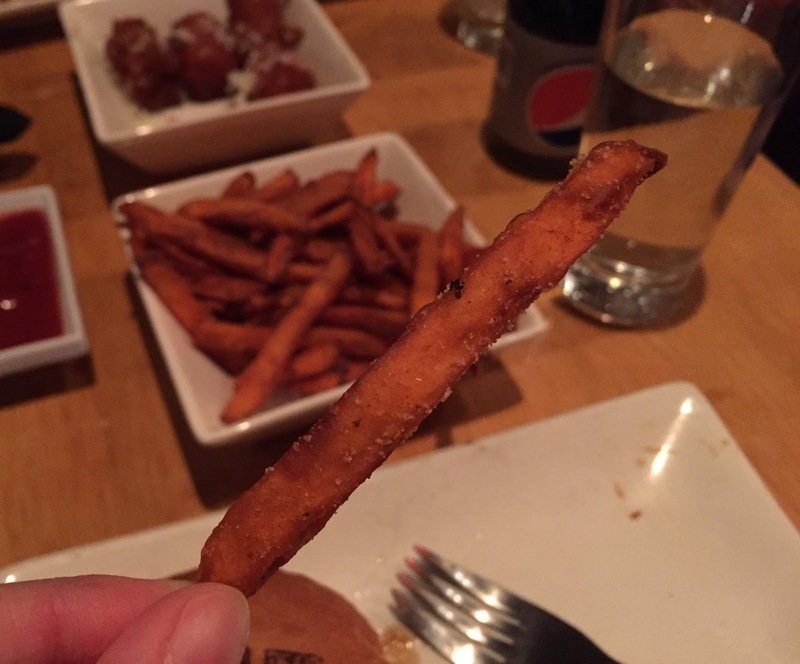 Sweet potato fries with our signature sweet salt, and when we ordered, we didn't know it'd be sweet. Signature Sweet Salt was basically cinnamon sugar and all the sweet potatoes were coated evenly. 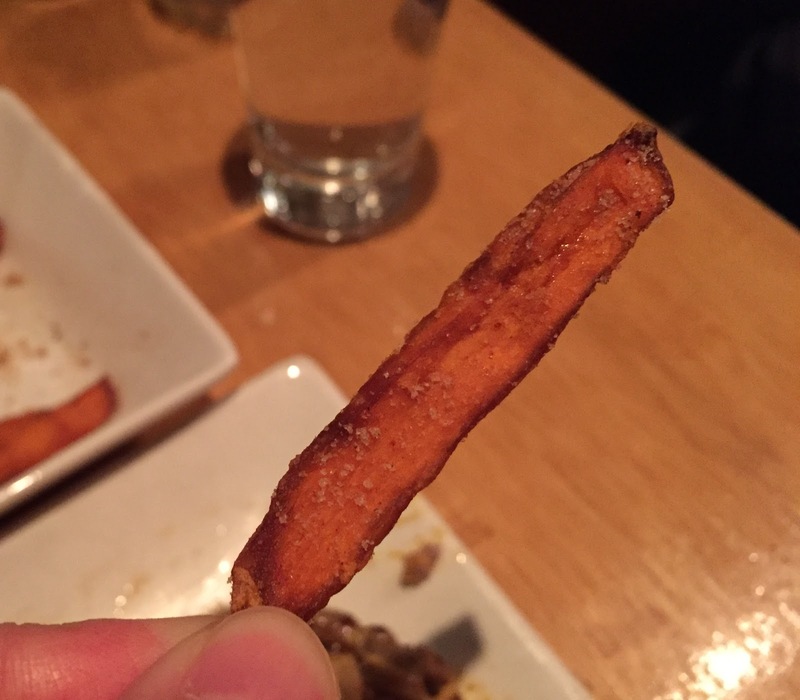 They're fried very well, not greasy but lightly crispy on the outside and moist inside, but I just couldn't get over the cinnamon because it's a side dish, not a dessert, besides I don't like cinnamon that much. Next time I'll order without the seasoning and my ask for salt on the side. 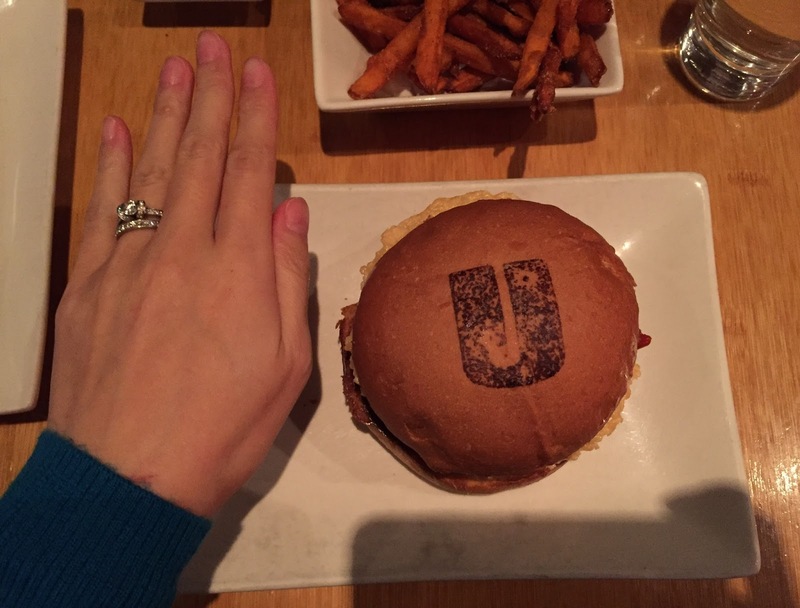 All the foods were freshly made and served hot, especially I liked Umami Burger and Truffle Fries. I think I'll try another location and other burgers next time.